What headsets are compatible with my phone? Wireless, DECT, Bluetooth, Wired, Monaural, Binaural - learn which headset works for your VoIP phone. 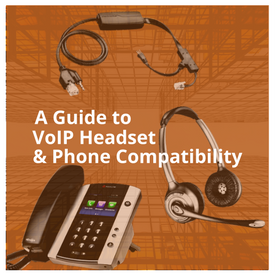 This educational guide to VoIP headset & Phone Compatibility covers top brands of VoIP phones and headsets including Grandstream, Sangoma, Cisco, Polycom, Yealink, Snom, Mitel, Digium, Jabra, Plantronics, Sennheiser, and VXi.